Join us for updates on all of the women’s ministries at Saint Matthias. From September through May, Father Bill Garrison leads the Saint Matthias Bible study group every Wednesday at 10 AM in the Chase Room. After the discussion, the group gathers for a brief Eucharist at 11 AM. Men eating badly (and having good conversation and fellowship). Holy Eucharist 5 PM • Join us for our quieter, more contemplative evening service, including a time of prayer for those in need of healing. All are welcome to participate in this pre-Mother’s Day event sponsored by the Episcopal Church Women. Tea sandwiches, scones, strawberries, tea, and juice will be served. The Saint Elizabeth’s Guild provides fellowship for the women of the church; the group meets at noon on the third Thursday of each month for a potluck luncheon. Our Time, a group for senior parishioners, meets on the third Tuesday of each month at 2 PM in the Saint Matthias chapel (just east of the Sanctuary). This week’s breakfast is hosted by the vestry. Contact Sally Schacht for details. This week’s breakfast is hosted by the youth and kids. The annual women's retreat will be held at Aldersgate Retreat Center in Pacific Palisades, July 26-28. Come to a fun, family-friendly, and instructive Seder (Passover) celebration with Dr. Larry Budner at 6:30 before the Maundy Thursday Service at around 7:15 p.m.
Join us every Thursday evening during lent for dinner and talks by Fr. Bill and Rev. Carole. 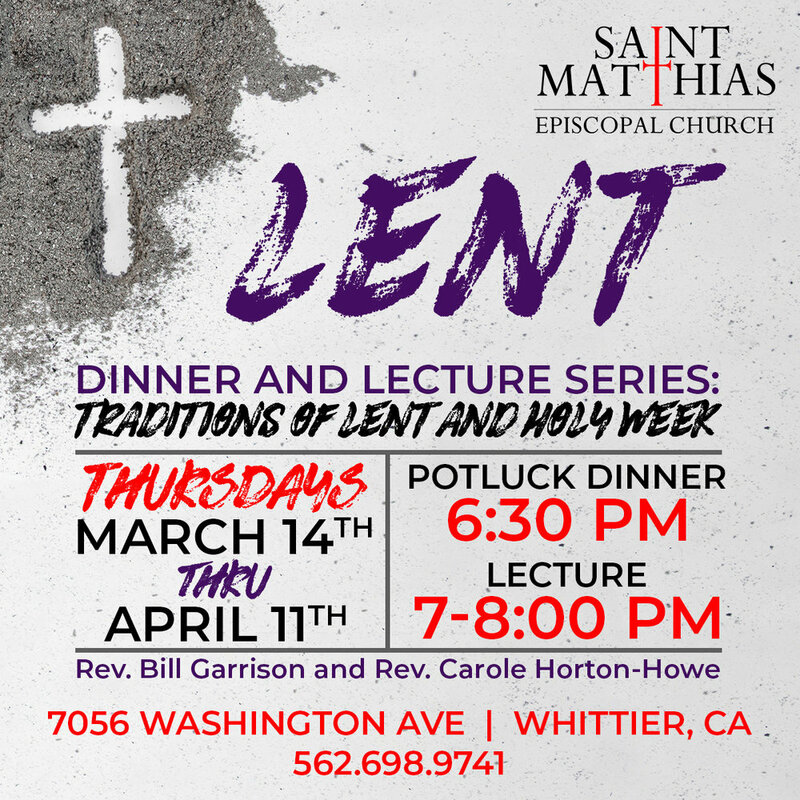 This year’s topic is traditions of Lent and Holy Week. This week’s talk is on Holy Saturday, the Great Vigil of Easter, and Easter Sunday. Men’s Desert Spirituality a.k.a. “Learning from the Monks” is a new men’s group at St. Matthias, creating a place for men to explore how monastic wisdom can guide and transform their lives. Beginning in the early centuries of the church and continuing to the present, in Eastern Orthodox, Roman Catholic, and Anglican traditions, monks devote themselves to lives of prayer and service, offering a deep spiritual well of practical wisdom for our journey towards God. This path includes silence, solitude, community, humility, and self-discipline. We will explore these and related themes Monday evenings during Lent from 6:00 to 7:00 p.m. in the sanctuary. For more information, contact Nate Warner. Anam Cara, the fellowship-focused and family-friendly group for younger adults at Saint Matthias, is hosting a potluck picnic on the playground after church on Sunday, April 7. All are welcome. Sign up on the clipboard in front of the church or contact Christina Olivos or Mary Ellen de la Vega for details. This week’s talk is on the Stations of the Cross and Good Friday. Learn how to use the features of stmatthiaswhittier.org, including online giving, the parish directory, and the calendar. This week’s talk is on the Passover Seder and Maundy Thursday. This week’s talk is on the services of Tenebrae and Palm Sunday.